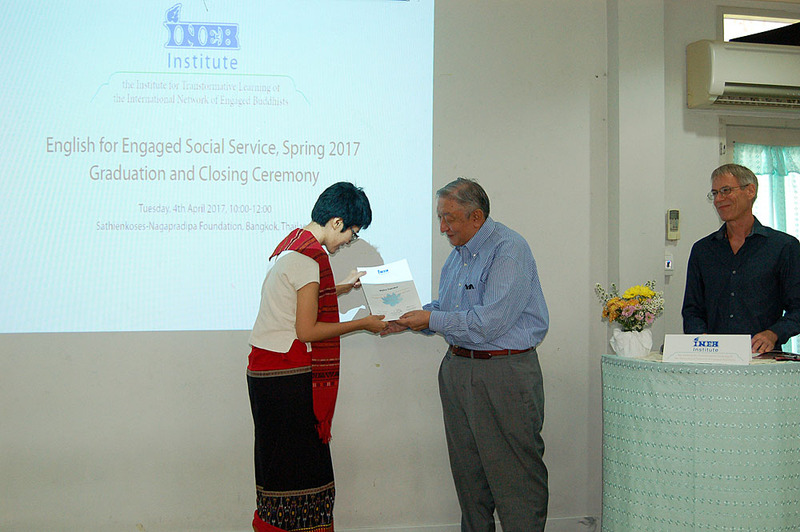 The Institute for Transformative Learning of the International Network of Engaged Buddhists (the INEB Institute), completed its second full three-month program, English for Engaged Social Service, in April 2017. This article reflects on the highlights of this program, where we think we need to go from here, and what you could do to help or participate in this project. 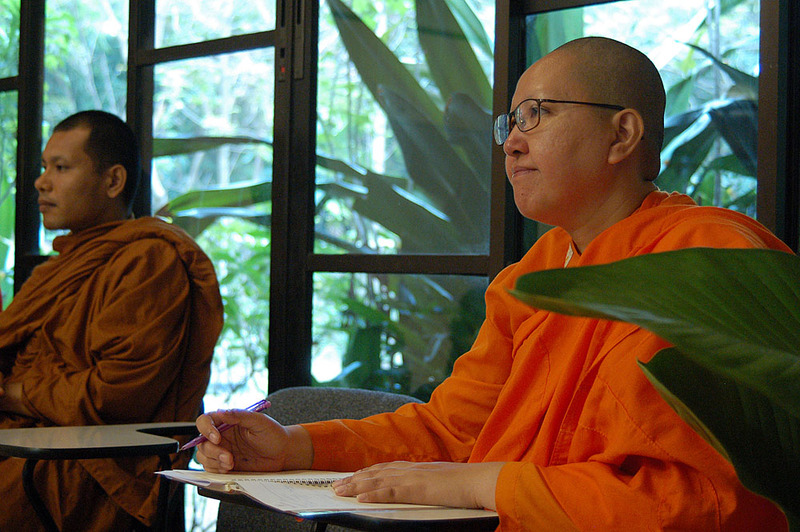 The INEB Institute’s three-month English course aims to develop the qualities necessary for compassionate leadership at a time of growing crisis and uncertainty. For leadership to be compassionate and clear-minded, we believe it must be grounded in a strong sense of connection with oneself, with the earth, with immediate others, and with local, regional, and international communities. The ability to think freely and develop confidence in one’s views and capacities are also essential. These qualities can be developed through training and the adoption of carefully selected personal disciplines and practices. The kind of student we ideally seek to reach is a young adult from Asia who has already shown some commitment to work for the common good through practices of personal and social transformation. Such commitments and practices have been at the core of INEB’s identity as an international network since its inception. Self-awareness, self-confidence, and full access to one’s own learning potential. Awareness and sensitivity to others, and the skills and motivations needed for mutual support and cooperation. Skills of understanding, speaking, reading, and writing English. Self-directed, freely chosen, and mindful leadership. Interpretive, critical thinking, and social analytical skills. Awareness of global crises—climate change, social inequality, violence, and lack of voice—and their local manifestations, as well as the many signs of hope that are now emerging around the world. Awareness of the personal dimensions of efforts towards social change. These areas are overlapping, and each has a subset of further skills or capacities that enable them. For example, the skills of awareness and sensitivity to others, mutual support, and cooperation, require a subset of skills that includes the ability to verbally appreciate others, the ability to listen with attention and respect as well as to keep confidentiality, the willingness to inquire into and accept cultural, ideological, and personal differences in an atmosphere of respect, and the willingness to trust and to share one’s personal thoughts and feelings in appropriate settings. Regular and sequentially organized classroom work in English and other areas. Workshops by national and international level trainers in a number of areas (e.g. 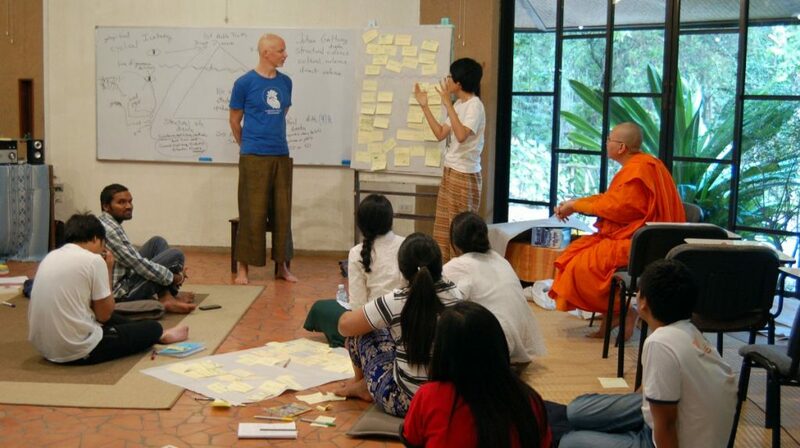 Power Analysis, Non-Violent Communication, Peer Counseling, and so on). 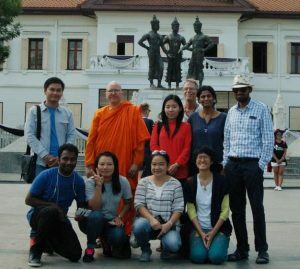 Field trips to observe and interact with intellectuals and community leaders in Thailand as examples of leadership, creativity, and social service. Personal and small group tutoring. Time for reading, writing, and communal watching of films. Collective work to maintain the classroom and other areas. Our English program for 2017 ran from January 8th to April 4th. We had a total of ten students, two of whom had to leave unexpectedly at the half-way point. 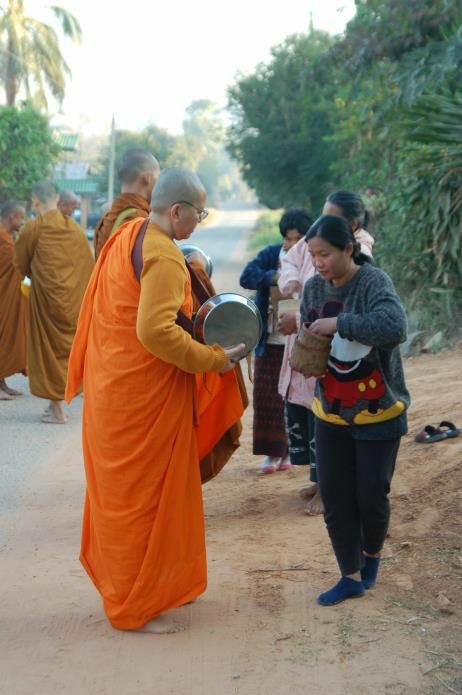 Of the ten students, seven were women—one of them a female monk (bhikkhuni)—and three were men. 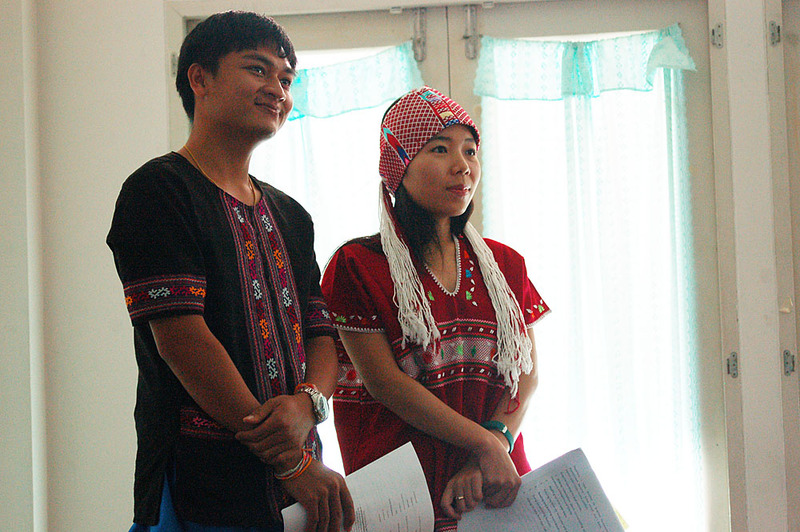 Their ages ranged from 19 to 40, and they came from Thailand, Myanmar, India, Laos, and China. Many of them were already involved as leaders at some level of social service work, and a few were teachers or workshop trainers. Their incoming English level ranged from Beginner to High Advanced, with most in the Intermediate range. Highlight 1 – All students’ use of English developed significantly, in some cases dramatically. 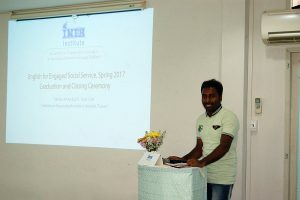 Upon entering the program, one young man from South Asia spoke so fast that hardly anyone could understand him. By the end of the program his speech was well modulated and understandable. We gave four practice TOEIC tests (a standard English proficiency test that measures listening and reading comprehension) throughout the course, and this individual’s scores showed a development from very low Beginner to Intermediate Level over the 12 weeks. One of the women who had to leave after six weeks raised her TOEIC score 270 points in that short space of time, even though we did not teach TOEIC vocabulary and testing strategies directly. Students’ growth in English took many forms, including greater confidence in expressing ideas, much faster comprehension, significantly wider vocabulary, and so on. 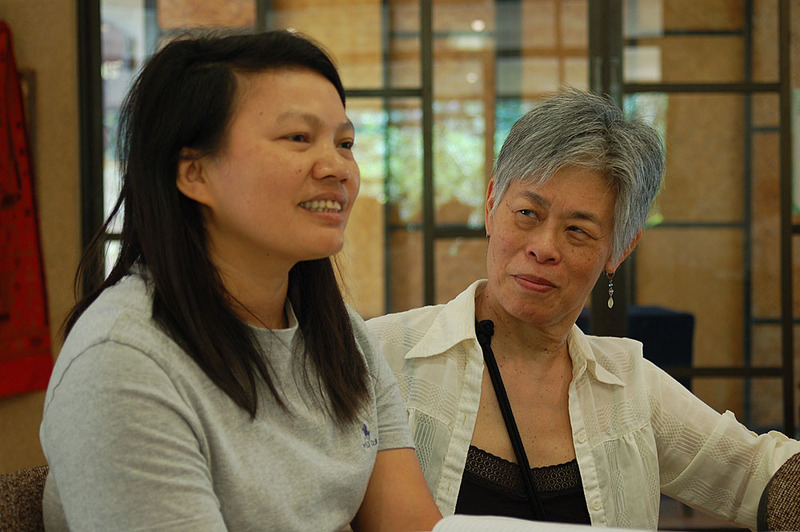 The diversity of the group was a key component in motivating students to communicate and make connections through English. Highlight 2 – As a graduation project, we asked all students to prepare a statement of goals they would like to take on in their own lives, as well as practical steps they could take to achieve those goals. We asked that the goals challenge and expand their habitual sense of what they can do, include some longer-term goals, and include goals the students have for others, whether they be family, community, ethnic group, or all of humanity. For us and for many of those who attended the graduation, the students’ statements were inspiring and articulate. They reflected the creativity and courage of students as they applied course skills and knowledge to their own life and home situations. 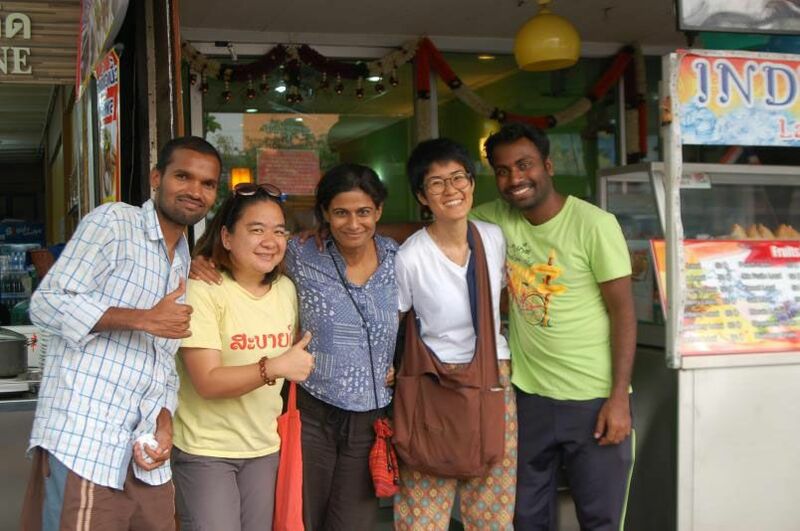 Highlight 3 – It is our assessment that this group developed a very strong sense of cohesion, mutual support, and safety. One small indication was when one student fell ill with a fever, some four or five other students stayed up late attending to him, caring for his needs, and keeping him company. But this support was also palpable in the classroom and elsewhere. We think that the foundation for this was likely the very extensive practice the students received in forming various kinds of listening partnerships. 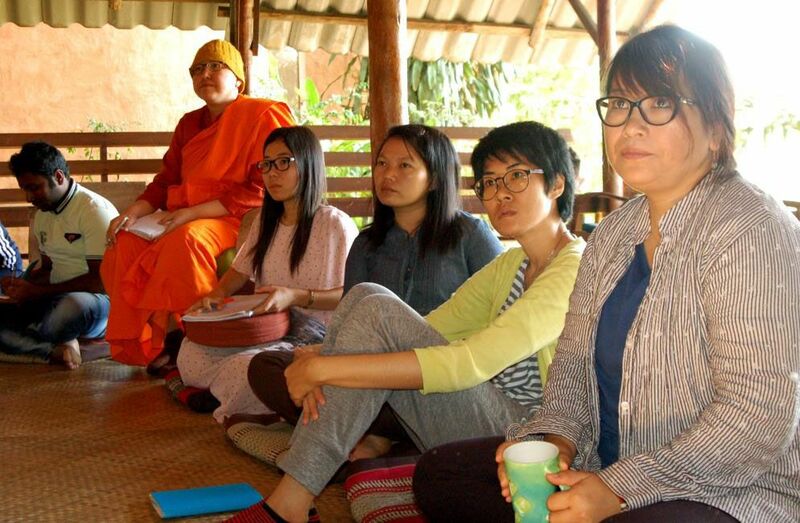 Ouyporn Khuankaew taught her own (feminist and power-sensitive) version of the deep listening developed by Vietnamese monk Thich Nhat Hanh in her three-day workshop, and I (Ted) regularly taught a form of peer counseling based on the principles of a practice known informally as “co-counseling.” Furthermore, a high-level international leader of the co-counseling communities, Francie Chew, was able to lead a two-day workshop to deepen the students’ skills. Virtually all workshop leaders included some time for mutual listening in pairs. As the director and lead teacher, I see such practices as essential to learning. They offer a chance for students to integrate what they have been learning by daring to say what is on their minds in the safe context of another person’s respectful attention. They thus increase students’ trust in their own thinking, and in the ability of others to offer kindness and support. In so doing they also offer a chance to overcome emotional blocks to appreciating life, enjoying closeness with others, and thinking clearly. Highlight 4 – While we addressed many themes and dimensions of learning in this course, we feel that our section this year on climate change was particularly clear and powerful. Many students expressed both a sense of having been changed by this information, and a strong desire to work to combat the effects of climate change and work for sustainability. For his required public presentation, one student did extensive research on the effects of climate change in his home region of China, and even made contacts with a scholar who had expertise in this area. Success in this part of the course has increased our confidence that we can attain similar clarity in each of the major course areas, even in a course of only three months. Highlight 5 – This course was the second time that Nila Premaratna and I worked together as the core teaching team. For the first time, we also had a full-time coordinator, Topsi Rongrongmuang. 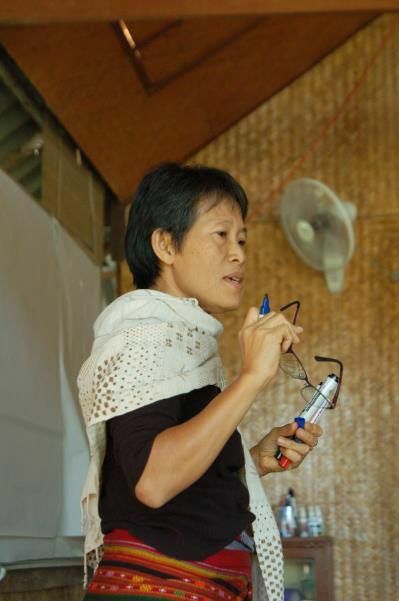 Her skilled coordination in turn enabled Nila and me to participate more fully in each other’s classes and to develop our curriculum to a much higher level of coherence, integrity, and effectiveness. We also understood better this time how to balance work requirements, rest, classroom teaching, field trips, and workshops, even though the workshops had to be clustered together more than we would have liked. We were also grateful to work once again with so many of the skilled and generous workshop leaders with whom we worked last year, and we learned how to better integrate their contributions into the course. Highlight 6 – Through class sessions, workshops, and field trips, students had the chance to meet, study with, and learn about extraordinary leaders, thinkers, and activists. These included Phra Paisal Visalo, Ven. 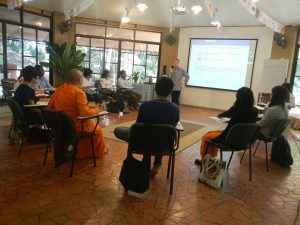 Dhammananda Bhikkhuni, Sulak Sivaraksa, Jeyanthy Siva, Ouyporn Khuankaew, Ginger Norwood, Jon Watts, Francie Chew, Pracha Hutanuwatr, Les and Poranee Sponsel, Krarok Wataksorn, Samana Chatwaro, and Khun Baiphut. We wish to express our thanks to all these leaders for generously sharing their time with our group. We want to find effective ways to follow-up with our student graduates, so that the learning they began with us will continue to take root and bear fruit. 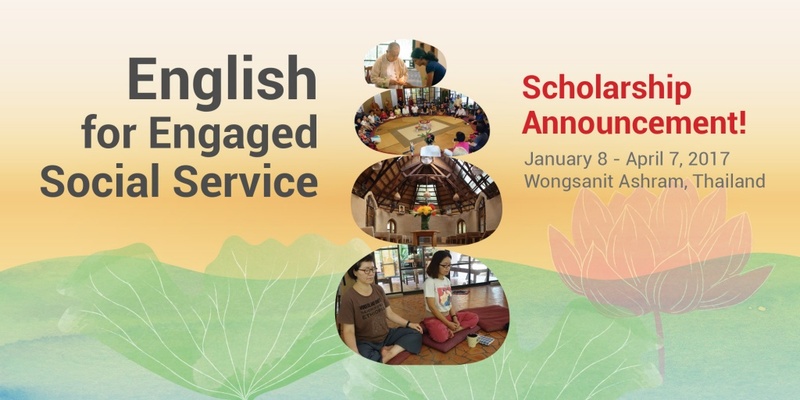 We are now planning a third English for Engaged Social Service course for January of 2018. That course will run from January 7th – April 5th, 2018, at the Wongsanit Ashram near Bangkok. We are also considering offering very short pilot English programs in other countries as a way to begin to explore how we might expand the program into new cultural settings. To meet our goal of training new course leaders, we will need to attract individuals with a serious interest in developing this course for their home communities. Most likely they would receive this training through participating as assistants in one or two of our courses before leading their own. We are now actively looking for such individuals, and we are committed to including them in the 2018 course. Finally, we are experimenting with different ways of supporting and maintaining contact with our former students. This might take the form of regular or occasional online meetings with them, or even offering local workshops organized by our alumni that could address a number of possible themes. If you find this program interesting or promising, we would like to encourage you to contact us and ask about possible permutations of this program that would meet your needs or those of your constituencies. We would be happy to receive your questions and to dialog with you about what components make this program effective, and how it might work for your organization or in your area. If you are interested in becoming a trainer, or could nominate someone you think would be very capable as a trainer, please get in touch with us. We would take your recommendation seriously and follow up with further contacts. Offering the English program regularly in different cultural contexts to students with limited resources requires substantial financial support. Our current per student cost is $5,800, not counting airfare from the home country. We would be very grateful if you or your organization could provide an annual or one-time scholarship that would support one or more students to attend this course. To the groups and individuals who sponsored or contributed to the 2017 program, we want to express our deep gratitude. Without your support, the program could not have been offered. Furthermore, your willingness to put your confidence in us, and in many cases to engage with us on the meaning, impact, and potential areas for improvement of the program, is profoundly encouraging and hopeful to us in challenging times like the present. 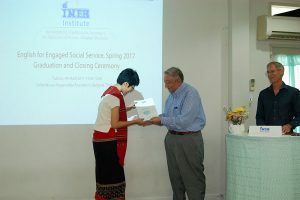 To stay up to date on developments for the English for Engaged Social Service and other INEB Institute programs, please visit: www.inebinstitute.org or email us at info@inebinstitute.org. Thank you very much! The full report can be download in PDF here. Our English for Engaged Social Service 2017 course begins January 8, 2017. We have a strong group of students but we still have seats available. The INEB Institute has decided to offer two full scholarships for the 2017 course, worth $5,800 each. The selection will be based on applicants’ past record of contribution to engaged social service, potential to contribute to the learning community, and potential to apply lessons learned in a significant way following the course. Applications and interviews will be the basis for judging. Applicants must have at least an intermediate level of English (we can help you decide if you do). We will continue to accept applications until these positions are filled. We welcome your application, whether you are Thai or from other countries, and whatever your status, i.e. whether you are a layperson, monastic, student, professional, homemaker, and so on.